UM-Flint Chancellor Susan E. Borrego delivers 2016 State of the University. 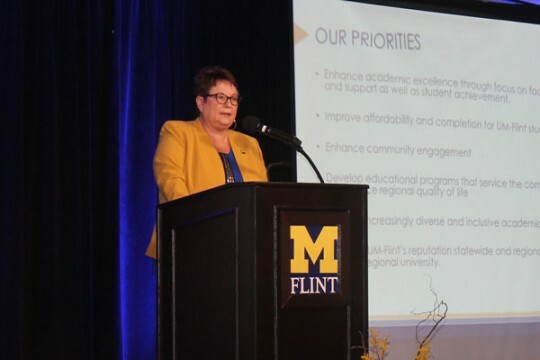 The University of Michigan-Flint will continue to leverage its talents and resources to help the broader community during the Flint water crisis, Chancellor Susan E. Borrego said in her State of the University address Wednesday. Borrego again confirmed that UM-Flint drinking water, tested and filtered for more than a year, is safe. However, she underscored the fact that the future of the university and city are intertwined. She pointed to numerous university contributions to tackling the problem so far, such as nursing students helping the Genesee County Health Department with lead testing, the university’s water crisis course offered free to the community this semester and for credit to students, and the GIS Center helping to map lead service lines under the supervision for Professor Marty Kaufman, PhD. “This is home for us and we will work with our community towards creating that stronger future,” Borrego said. 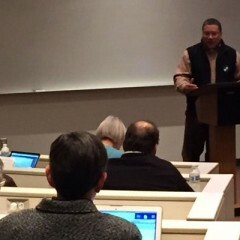 Borrego said the university and city’s story extend far beyond the water crisis. Part of that story is UM-Flint’s commitment to public engagement. During her address, Borrego celebrated numerous achievements by faculty, staff, students, and the overall university, such as a new master’s in Applied Communication program; the Physical Therapy department establishing residency programs in pediatric and neurologic physical therapy, in addition to the previously established orthopedic residency; and social work interns working in Genesee Family Court to advocate for parents and children. Borrego also said a major focus of the university is helping students succeed. 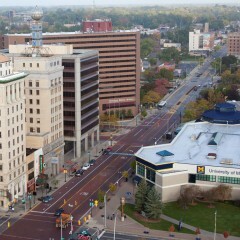 Richard Russell, a special projects coordinator in the dean’s office of the School of Education & Human Services, said the chancellor’s presentation was “encouraging,” as the university partners with the city of Flint and utilizes its academic and research skills to help with the water crisis. “It is one of those presentations that brings me hope, and hopefully brings the community of Flint hope,” he said. Amged Eidelsafy, president of the UM-Flint Student Government, said he liked the chancellor’s focus on diversity, inclusion, and student success. And the emphasis that the university is part of a larger community. “Today was a great reminder,” he said.